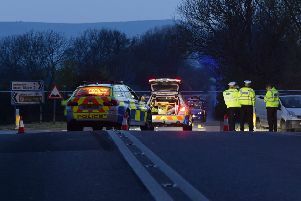 A road on the approach to Hastings was closed after a car collided with a telegraph pole, says Sussex Police. The A2100 was closed from Powdermill Lane, Battle, to Beauport roundabout, in Hastings, after the collision at 12.25pm today (Monday September 3). Police said there were no injuries and no other vehicles involved. Traffic reports said the road was closed in both directions and affecting traffic between Battle and Hastings. A spokesman for the South East Coast Ambulance Service (SECAmb) said one ambulance crew attended the scene but no one required hospital treatment.